Upgrade to "Do It All" package for just $45 more and enjoy jet skiing and banana boats also! Soar some 500 feet in the air with the clear blue waters of the Atlantic Ocean beneath you, and then explore those same clear blue waters using a mask and fins! This Bahamas combo package brings two of the best water activities available in Nassau together for one unforgettable and thrilling tour package! 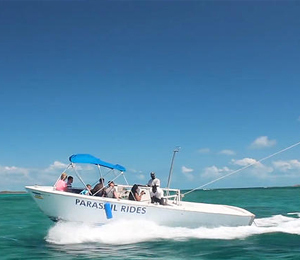 With the Nassau Paradise Ocean Snorkel and Parasailing Combo tour, guests get to experience a wide spectrum of activities available to them in Nassau. Not only do guests get the chance to snorkel at the coral reef gardens and parasail up in the air like a bird, they also get to spend time on one of Nassau's remote satellite beaches and enjoy a delicious, expertly prepared Bahamian style grilled lunch. If you cannot decide what to do while you are in Nassau, these combo tours are a great way to go! There is the famous Do It All package which includes snorkeling, parasailing, jet skiing, and banana boats, but if all that action is not quite your cup of tea, this Snorkeling and Parasailing combo just might be! The tour takes you out to the thriving, colorful coral reef gardens off the coast of Nassau, where hundreds of unique marine species live. We provide your snorkeling gear, including mask, fins, and snorkel, as well as instruction. Before you know it, you will be swimming at the surface of the water and taking in a beautiful world unlike any other beneath the water. Then, it is time to experience the thrill and excitement of a Nassau parasailing adventure! If you have never been parasailing before, Nassau is a great place to get started! You will get to see some truly awesome views of this Bahamian water landscape. If you have gone parasailing before, do not miss your chance to do it here! The tour wraps up with some time spent on one of Nassau's famous beaches, where you get to bask in the warm sun or take a dip in the refreshing salt water. We also provide a delicious Bahamian style lunch complete with barbecue chicken and the signature Bahamian dish, peas and rice! What island do you snorkel at? Snorkeling is usually done at Athol Island, weather-permitting. Otherwise we have a few other snorkeling destinations we can go to. With all the media hype it's understandable why people offten ask this question but the truth is that unprovoked shark attacks are very, very rare and attacks on snorkelers are even more rare. Our staff are all trained in making sure your trip is safe and enjoyable. Weight limit for Parasailing is 350lbs max. Current BLACK-OUT DATES for 2018 (please note that if you make a reservation for one of these dates, you will be contacted and informed that we are not available for these dates.) Please call our offices for alternative excursions in Nassau if the date you're looking for is listed below. I have been to the Bahamas many times, but Bahamas Ocean Snorkel & Parasailing Combo is one of my favorite trips! It includes everything that everyone should do here. As a Bahamas veteran, I can say only the best about this experience!